“What’s wrong Ash?” said Jeremiah as she reached the ground. “Why would anyone be hiding in our tree?” asked Jeremiah. “It was probably just the wind. Come on, let’s go. You can be Princess Ashley,” he wheedled. “Fairy Bear,” Ashley corrected him, giggling. Jeremiah saluted and picked up a small branch from the ground for a sword. Jeremiah tucked his sword into his belt and began to climb up the ladder. He imagined himself to be Sir Edmund Hillary scaling the treacherous heights of Mount Everest, battling the elements with every step. As he reached the summit, he paused and looked carefully around. He didn’t really believe there was anyone up there, but he decided to check anyway. After all, he had heard the rustling sound as he climbed up. And though the wind may have been blowing madly on Mount Everest, here at Castle Fairy Bear it wasn’t strong enough to make that much noise. He wasn’t going to admit that to Ashley, though. He proceeded to cautiously scout out the terrain. When he was satisfied that no one was up there, he quietly entered the castle. As he went inside he heard another noise, different from the rustling. And this time it came from directly in front of him! Quickly drawing his sword, he advanced on the enemy. Catching sight of the intruder, he stopped and stared. Waiting anxiously down below, Ashley heard nothing but silence. Then suddenly, Jeremiah’s voice came from above. “A bomb?” said Ashley, alarmed. “An egg?” said Ashley, confused. “It’s not one of Mother’s chickens. This one is all red,” explained Jeremiah. “How am I supposed to get the spy out of the tree, I mean castle?” asked the Captain. “Then it shall be done,” declared the Princess, dashing royally off to the house to retrieve the box. It took Jeremiah a few minutes to chase the spy into a corner so he could pick her up. Then he gently put her in the box that Ashley had brought up. The box was then put into the basket. Using the rope, he slowly lowered the basket to Ashley who was now waiting at the bottom of the tree. The children took their prisoner over to the chicken house dungeon and released her. As they watched her through the fence, she headed straight for the feed tub and began to eat. Ashley didn’t like the looks of this spy chicken. She wasn’t pretty like Mother’s chickens. She didn’t sparkle in the sun. In fact, she was the color of the old rusty latch on the barn door. “She probably doesn’t lay pretty eggs, either,” Ashley grumbled to herself. “Spot?” Ashley sputtered. “Spot? That’s an ugly name for an ugly chicken!” she declared. “That is quite enough, Ashley,” said Mother sternly. “Macy is not stuck-up, she is just very shy. I will not allow you to talk about her that way. As for what you’re going to say, you should decide quickly. Mr. Adams has gone to town, so I have invited Mrs. Adams and Macy for dinner.” Then Mother left to go pick vegetables from the kitchen garden. Ashley looked at Jeremiah who had been standing very quietly by the corner of the chicken house. He shook his head slowly, then whistled to Sheila-the-Wonderdog and ran off to the pasture to play. Ashley watched as Jeremiah climbed over the top of the split rail fence surrounding the pasture. Sheila-the-Wonderdog just squeezed under the bottom rail instead of jumping over. Soon they were both hidden by the tall grass swaying in the gentle summer breeze. After they were gone, she wandered slowly back over to the oak tree and spent the rest of the morning sitting quietly by herself in the tree fort, thinking about what Mother had said. I am what my family affectionately describes as “directionally challenged”. I was born with a complete and utter lack of a sense of direction. As far as I am concerned, north is whatever direction I happen to be facing at the time. I have an unshakable belief that it is hereditary, (my uncle suffers from the same affliction), no matter what my father says. Regardless of the cause, because I suffer from this particular disability, I never drive anywhere without detailed instructions and maps from the internet. Imagine my delight when, on a trip to Dallas with some girlfriends, I was introduced to GPS! You tell it where you are and where you want to go and it figures out how to get you there! What a delightful little magic box! It has a very nice voice that tells you where to turn, as opposed to the ones that typically come rudely from the back seat. And if, for some entirely unavoidable reason, you should miss a turn, does the GPS have a conniption and cast disparaging remarks on your mental capacity? No! Does it whine about being dizzy? No! It very calmly tells you, “Recalculating route”. That’s all, just “Recalculating route”. Wow! No more guesswork, no more squinting to see microscopic street signs, no more driving around in circles because, “I’m sure it’s just down here!” What freedom from maps that simply refuse to re-fold, shuffled MapQuest pages, and hand scribbled directions that have sudden become ancient Sanskrit. “Wouldn’t it be amazing,” I mused, “If my life’s journey had a GPS? Something that would help me stay on the right track”. In a sense, those of us who know God, do have a GPS for our life’s journey. Holy Spirit knows where we are supposed to be going and exactly how to get us there. The Bible tells us in Isaiah 30:21, “Whether you turn to the right or to the left, your ears will hear a voice behind you, saying, ‘This is the way; walk in it’.” All we have to do is listen for His voice. Unfortunately, most of us put more trust in a magic GPS box than we do in God. Why is that I wonder? Perhaps it’s because the “still, small voice” gets drowned out by the busyness of our lives. Perhaps it’s because we don’t recognize the voice as His. Perhaps it’s because He wants to take us off the beaten path. Whatever the reason, we all take many unplanned detours in our life’s journeys. The beautiful thing is that as soon as we realize we’ve missed a turn, we can stop and turn around and ask God to show us the right path again. And without recriminations, Holy Spirit simply tells us, “Recalculating route”. This is what I made for dessert the other night. Doesn’t it look pretty? I usually make it in a large bowl, but I thought the mini bowls were kind of fun. Trifle is a traditional English dessert usually served for special occasions (or at least that’s how it was when I lived there about a hundred years ago). The bottom layer usually consists of ladyfingers on the bottom and sides of the bowl, sometimes moistened with sherry, then a layer of fruit. That is then covered with a layer of fruit preserves, a layer of custard, and a layer of whipped cream. Yummy!! I usually don’t have ladyfingers, although I can find them every once in a while. So, I have to be creative when I make it. 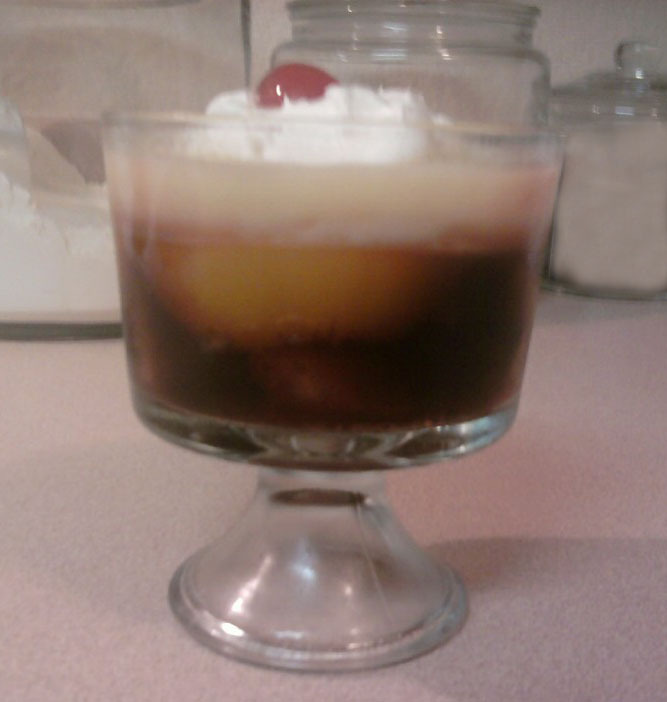 Here is what I do: I put a layer of cubed pound cake in the bottom, put in a layer of peaches and then cover that with black cherry jello. Followed by a layer of real English custard compliments of some real English people that brought me some mix on one of their visits. Thank you Richard and Audrey! 🙂 When I run out of the custard mix I will go back to using vanilla pudding or making the custard from scratch. Top that off with whipped cream and a cherry and, voila! Trifle! I would love to hear how you would make it. What kind of fruit would you use? Nuts or no nuts on the top?